Post recovery on 23rd Jan, the crypto market is rather on a downhill movement. Here is walk through the ups and downs of the Bitcoin, EOS, Ethereum, Bitcoin Cash, Ripple, ADA, and other altcoins. 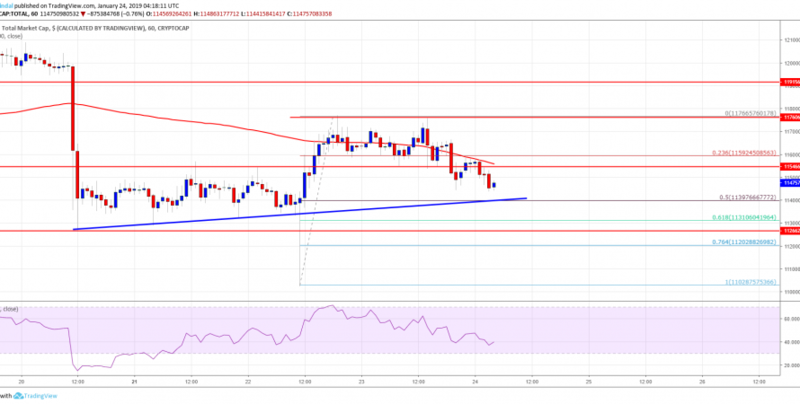 Despite the rise of 126 dollars and 128 dollars against U.S. Dollar, and breaking the 130 dollars resistance level, Bitcoin Cash could not stay strong above the 132 Dollars resistance level. Following this, there has been a downside correction after which the rate went lower than 130 Dollars. There is a risk of a further stretched downturn to 126 dollars and even 125 dollars, after the initial support of 128 dollars. On the brighter side though- the investors interested in buying Bitcoin Cash will have to jump the 130 dollars and 132 dollars targets to achieve profits. Recently EOS was seen at the 2.50 dollars resistance. Due to a price correction, the rate is sinking lower than 2.45 dollars. There is a chance for it to go even lower to support levels of 2.40 dollars and even 2.35 dollars. Tron’s rate, on the other hand, stayed comparatively strong and surpassed support levels of 0.0250 dollars and 0.260 dollars. There are chances of it to soar the resistance levels of 0.0280 dollars and even 0.0300 dollars. Similar to Tron, Cardano also has good news. Its rate managed to soar above the support level of 0.0420 dollars. On the other hand, ADA was found fighting to soar higher. Its resistance levels were- 0.0440 dollars and 0.0450 dollars. If it soars higher, there are chances of it going towards 0.0500 dollars. If we look at the overall crypto market hourly chart performance, 117.00 Billion Dollars and 117.50 Billion Dollars were the breaking resistance levels. At 115.00 Billion dollars a downwards slide could be seen all over the market. If we look at the supports on the downside, one could see several close to 114.00 Billion dollars and 112.50 Billion levels.